Captain Ben Wolfe of Sport Fish Michigan – AnglingBuzzTV fishing report for mid-June. Michigan bass fishing is legendary, and June is presenting great opportunities on both inland lakes and larger bodies of water like Lake Huron, Lake Michigan, Grand Traverse Bays, and Saginaw Bay. Smaller inland lakes warm the quickest, and the biggest and deepest bodies of water warm the slowest. With waters ranging anywhere from the mid 40’s to the mid 50’s depending on which lake, the patterns can vary. From the onset of the season, we like to target smaller bodies of water. Blade baits can be great when the water is below 45 degrees. With a rip and a pause, or a hopping retrieve off of the bottom, a blade bait can really pay dividends with some great bites. As the waters warm above the 45-degree mark and into the low 50’s, a jerk bait really comes into its own. Generally, a cadence involving a combination of long pauses after a few jerks or pulls of the rod tip can be the ticket to getting bites. Smallmouths are sight feeders, and often will inspect a bait for quite some time before deciding to commit. This is a combination of audible and visual presentation. The jerking portion of the cadence creates flash and noise to call a fish in, whereas the pause portion of the retrieve can seal the deal. The colder the water, the longer the pause. A swim bait can also be a great option this time of year. It’s also a visual presentation, but it’s subtle. For fish that are first moving up onto the flats from their deeper winter and early spring locations, they can be spooky. A subtle bait style like a swim bait can be a deadly presentation, and really shines as the waters warm into the 50’s as the fish truly go on the prespawn feed! When the waters hit the mid 50’s, a spinner bait is another great option for thunderous strikes. But don’t be too surprised if a stray pike or two also finds a spinnerbait appealing! Grand Traverse Bay is still cold for May, as it is a big body of water that can reach down to depths over 500 feet on East Bay. Sunny days will help warm this body of water, and when we do have those sunny days, the bass will flock to the shallower waters to sun bathe on the sand. 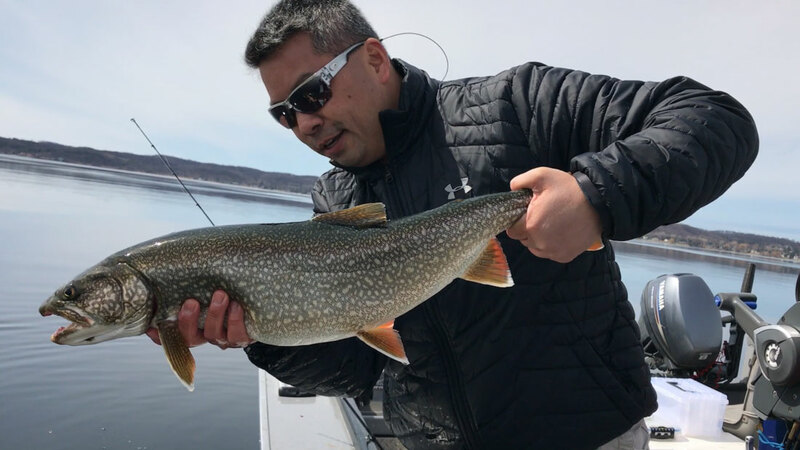 Often is the case that the bass fishing is so good on the inland lakes, both for size and numbers, that we at Sport Fish Michigan and Traverse City Bass Guide Service often steer away from the bay altogether until late May.